Countless numbers of Catholics throughout the world have discovered the great gift of The Alpha Course. This course has helped many renew their faith and commitment to Christ. 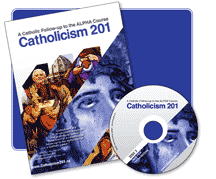 Catholicism 201 arose out of the need for a Catholic follow-up that was directly intended to follow after the Alpha Course.It is modeled after The Alpha Course and inspired by it. Catholicism 201 was produced in 2006 and is now running worldwide in 24 countries. It is an eight session course that can be run in six weeks or 12 weeks including a retreat day.